SCVHistory.com | Heritage Junction | About the Namesakes of the Kingsburry House, by Jerry Reynolds. About the Namesakes of the Kingsburry House. Kingsburry House at Heritage Junction Historic Park, Newhall. Photo ©Jessica Boyer 2016. Click to enlarge. Realtor Jim Droz and Dr. Alan Fine, a local dentist, donated the Kingsburry House to the Santa Clarita Valley Historical Society in 1987 as they were preparing to redevelop the property at 24318 Walnut Street into a modern dental office building. When the house was moved to Heritage Junction in July of that year, it was believed the structure was built in 1911 by August Ferrier, a local prospector and town character. A 1911 construction date is what L.A. County Assessor records would have shown at the time. Jerry Reynolds, the Historical Society's curator, subsequently learned the house was significantly older. He discovered it was built in 1878 — the year downtown Newhall moved from present-day Saugus to present-day Newhall — making it Newhall's oldest existing "new home." There may be one or two structures in Newhall today that are as old or older, but this is the oldest surviving house built for a resident of the town of Newhall — specifically J.O. Newhall, Henry M. Newhall's cousin who ran the Southern Hotel, which stood from 1878-1888. According to an 1889 publication, J.O. Newhall's address was 1½ Spruce Street, where he lived with his wife, the former Miss Laura E. Terry, a novelist of some prominence. Albert Swall would build his hotel and meat market (butcher shop) on this property in 1914. (Swall's hotel was later Ralph Williams' Newhall Pharmacy, Work Boots, and as of 2018 the Old Town Newhall Junction restaurant). 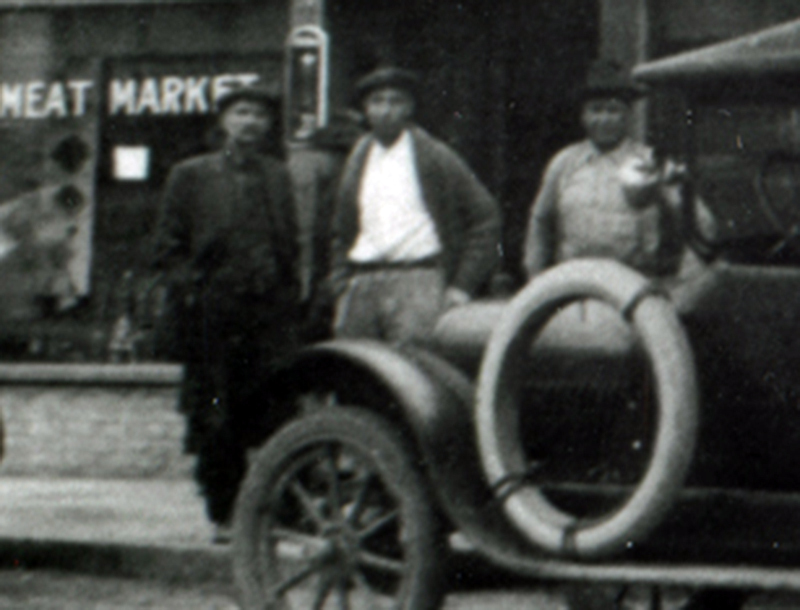 Homeowner and -mover August Ferrier, at left, stands in front of the Swall hotel and meat market in 1920. Click for full image. Thus, Reynolds discovered, Ferrier didn't build the house. He merely moved it in 1911 one block west from its original location at the southwest corner of Market and Spruce (now Main) streets to Walnut Street. Ferrier must have sold the original home site to Swall, or to someone who flipped the property to Swall. We see Ferrier in a 1920 photograph, standing in front of Swall's hotel where the house once stood. 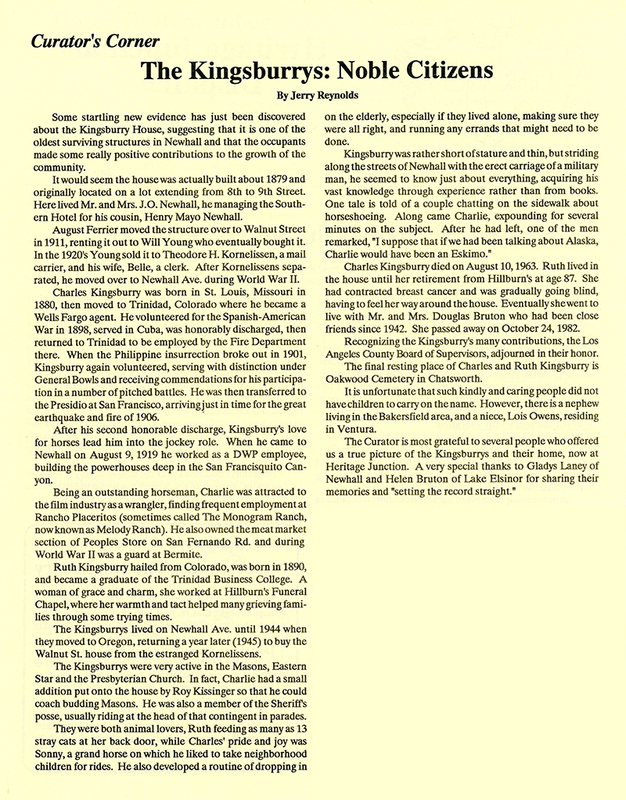 So, who was Charles Kingsburry? Little was known about him in the 1980s — so little, in fact, that his surname was often misspelled. But Reynolds tells us who he was (below). Reynolds attributes his newfound information to a couple in Lake Elsinore with whom Ruth Kingsburry (Charles' widow) lived out her final years; and to lifelong Newhall resident Gladys Laney, who was born here in 1910, lived 104 years, and was in full command of her faculties until her death in 2014. The Lake Elsinore couple probably had access to the Kingsburrys' vital records, because the dates in Reynolds' final article from 1993 are correct. (Note: Public records conflict on Charles' birthdate — either August 18 or 19, 1879. He was roughly the same age as his namesake house.) The Kingsburrys left no issue. Heritage Junction Dispatch, Vol. 15 No. 1 | January 1990. 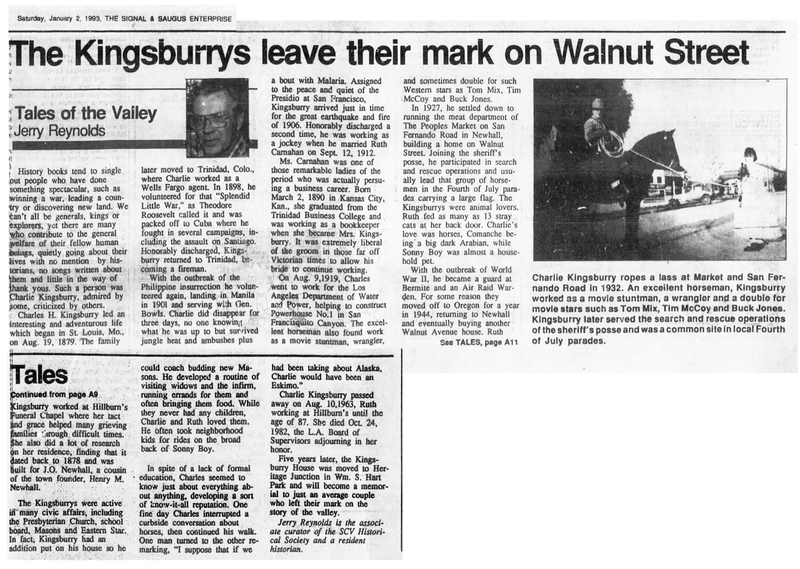 Some startling new evidence has just been discovered about the Kingsburry House, suggesting that it is one of the oldest surviving structures in Newhall and that the occupants made some really positive contributions to the growth of the community. It would seem the house was actually built about 1879 [sic: Reynolds subsequently says 1878] and originally located on a lot extending from 8th to 9th Street. Here lived Mr. and Mrs. J.O. Newhall, he managing the Southern Hotel for his cousin, Henry Mayo Newhall. August Ferrier moved the structure over to Walnut Street in 1911, renting it out to Will Young who eventually bought it. In the 1920s, Young sold it to Theodore H. Kornelissen, a mail carrier, and his wife, Belle, a clerk. After the Kornelissens separated, he moved over to Newhall Avenue during World War II. Charles Kingsburry was born in St. Louis, Missouri, in 1880 [sic: August 1879], then moved to Trinidad, Colorado, where he became a Wells Fargo agent. He volunteered for the Spanish-American War in 1898, served in Cuba, was honorably discharged, then returned to Trinidad to be employed by the Fire Department there. When the Philippine insurrection broke out in 1901, Kingsburry again volunteered, serving with distinction under General Bowls [sic: Brig. Gen. J. Franklin Bell?] and receiving commendations for his participation in a number of pitched battles. He was then transferred to the Presidio at San Francisco, arriving just in time for the great earthquake and fire of 1906. After his second honorable discharge, Kingsburry's love for horses led him into the jockey role. When he came to Newhall on August 9, 1919, he worked as a DWP employee, building the powerhouses deep in the San Francisquito Canyon. Being an outstanding horseman, Charlie was attracted to the film industry as a wrangler, finding frequent employment at Rancho Placeritos (sometimes called the Monogram Ranch, now known as Melody Ranch). He also owned the meat market section of Peoples Store on San Fernando Road and during World War II was a guard at Bermite. Kingsburry leads the Sheriff's posse in Newhall's 1934 Fourth of July Parade. Click for more. Ruth Kingsburry hailed from Colorado, was born in 1890 [March 2], and became a graduate of the Trinidad Business College. A woman of grace and charm, she worked at Hillburn's Funeral Chapel, where her warmth and tact helped many grieving families through some trying times. The Kingsburrys lived on Newhall Avenue until 1944 when they moved to Oregon, returning a year later (1945) to buy the Walnut Street house from the estranged Kornelissens. The Kingsburrys were very active in the Masons, Eastern Star and the Presbyterian Church. In fact, Charlie had a small addition put onto the house by Roy Kissinger so that he could coach budding Masons. He was also a member of the Sheriff's posse, usually riding at the head of that contingent in parades. They were both animal lovers, Ruth feeding as many as 13 stray cats at her back door, while Charles' pride and joy was Sonny, a grand horse on which he liked to take neighborhood children for rides. He also developed a routine of dropping in on the elderly, especially if they lived alone, making sure they were all right, and running any errands that might need to be done. Kingsburry was rather short of stature and thin, but striding along the streets of Newhall with the erect carriage of a military man, he seemed to know just about everything, acquiring his vast knowledge through experience rather than from books. One tale is told of a couple chatting on the sidewalk about horseshoeing. Along came Charlie, expounding for several minutes on the subject. After he had left, one of the men remarked, "I suppose that if we had been talking about Alaska, Charlie would have been an Eskimo." Charles Kingsburry died on August 10, 1963. Ruth lived in the house until her retirement from Hillburn's at age 87. She had contracted breast cancer and was gradually going blind, having to feel her way around the house. Eventually she went to live with Mr. and Mrs. Douglas Bruton who had been close friends since 1942. She passed away on October 24, 1982 [in Lake Elsinore]. Recognizing the Kingsburrys' many contributions, the Los Angeles County Board of Supervisors adjourned in their honor. The final resting place of Charles and Ruth Kingsburry is Oakwood Cemetery in Chatsworth. It is unfortunate that such kindly and caring people did not have children to carry on the name. However, there is a nephew living in the Bakersfield area and a niece, Lois Owens, residing in Ventura. The Curator [Reynolds] is most grateful to several people who offered us a true picture of the Kingsburrys and their home, now at Heritage Junction. A very special thanks to Gladys Laney of Newhall and Helen Bruton of Lake Elsinore for sharing their memories and "setting the record straight." The Newhall Signal and Saugus Enterprise | Friday, July 21, 1944. The Masonic Hall was the scene of a farewell party, Tuesday evening, in honor of Mr. and Mrs. Charles Kingsburry who are moving to Oregon. Seventy-five friends of the couple quickly planned a pot-luck dinner when it became known that they were leaving. The evening was spent informally, with some playing cards, others visiting. The Kingsburrys were presented with a going-away gift. Underneath the gaiety was a note of sadness. There always is when good friends must part. Ruth and Charlie will be missed at the social meetings of the community. During the time that Charlie served as president of the Masonic Club, it enjoyed one of the most successful social seasons of its existence. He worked untiringly. The attendance often ran to 100 or more. Charlie never complained about the work it took to organize these affairs. He enjoyed them as much as anybody. And behind his efforts, you could always find Ruth. The Newhall Signal and Saugus Enterprise | Thursday, July 19, 1945. 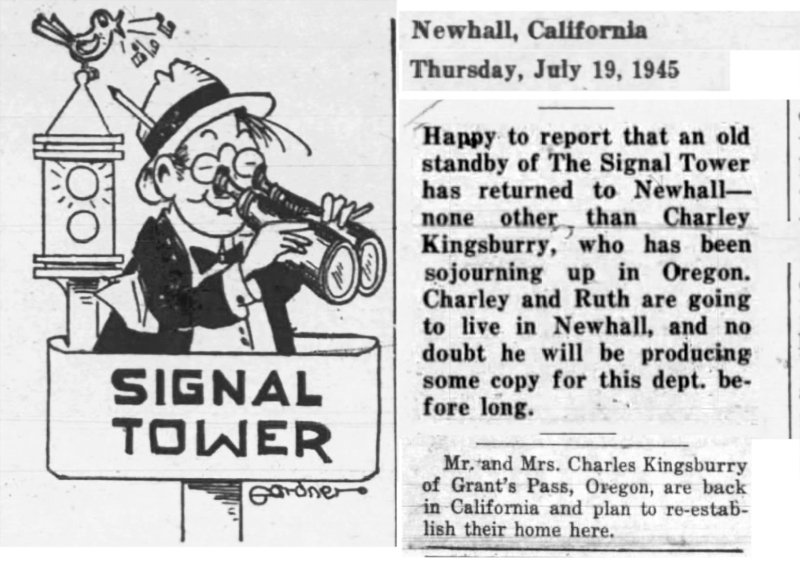 Happy to report that an old standby of The Signal Tower has returned to Newhall — none other than Charley Kingsburry, who has been sojourning up in Oregon. Charley and Ruth are going to live in Newhall, and no doubt he will be producing some copy for this dept. before long. Mr. and Mrs. Charles Kingsburry of Grant's Pass, Oregon, are back in California and plan to re-establish their home here. The Newhall Signal and Saugus Enterprise | Thursday, January 31, 1946. The Newhall Masonic Club, largely inactive during the war years, was reorganized at a meeting held at the Masonic Hall Monday night, and Charles Kingsburry was chosen president. Other officers elected were William Stonecypher, vice-president; Lou Taylor, treasurer; and Ted Kornelissen, secretary. Another meeting has been called by President Kingsburry for Monday night, Feb. 4, at which time an activity program for the year will be discussed. In general, President Kingsburry stated, it is hoped to revive the social activities which made the Masonic Club one of the most active organizations in the community in pre-war years. A number of committees will be announced later. About twenty Masons attended the meeting Monday night. Faded House Reminder of a More Gracious Era. The Newhall Signal and Saugus Enterprise | Thursday, December 22, 1989. It stands there in a brushy draw on the far side of Hart Park, a faded remnant of a bygone era when life was lived at a far more easy and gracious pace. Wooden columns line the front porch of this house, which is topped by a steeply sloping pyramid-shaped roof. Once children ran across its polished hardwood floors, Christmas decorations festooned its stately pillars, papered walls witnessed laughter and tragedy. It is, for want of a better name, called the Kingsburry House, part of a growing collection of structures being assembled by the Santa Clarita Valley Historical Society — most of which have been snatched from the clutches of rapacious developers. 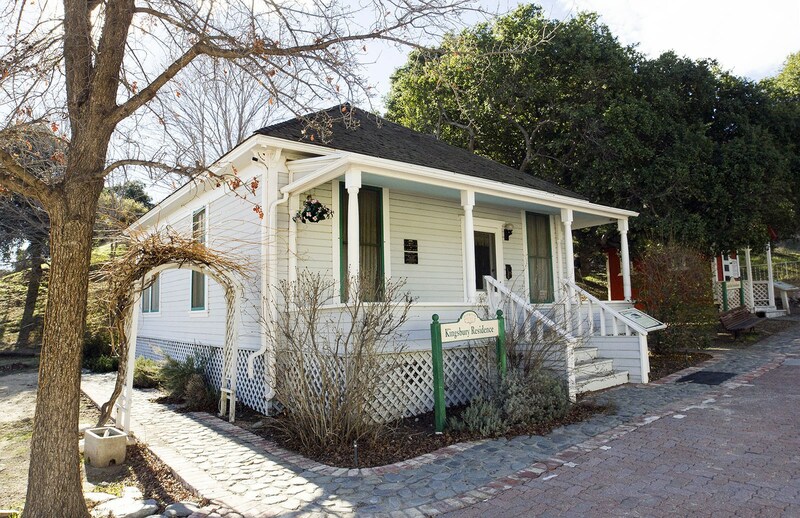 The Kingsburry is a small colonial-style dwelling that was rescued from Walnut Street in Newhall two years ago, mainly because of its unusual architectural style. Only recently has it been learned that the building is far older than anyone thought and had a truly colorful career. Back in 1876, the town of Newhall was founded at Bouquet Junction as a stop on the Southern Pacific Railroad. After two years, the station was moved down to Market and Railroad avenues as the wells went dry and, of course, the village followed along. It was then that Henry Mayo Newhall built an impressive, two-story Victorian hotel called The Southern, adding it to other properties, which included 48,000 acres that would become The Newhall Land and Fanning Co.
From Saugus, Mass., he brought a cousin, J.O. Newhall, to manage The Southern Hotel in 1876. Shortly thereafter, the home was completed on Spruce Street (now San Fernando Road) [now Main Street], J.O. and his family moving in. Newhall moved over to 13th Street and, it is said, Lyman Stewart occupied the house, enlarging it before almost going broke in the oil fields of Pico Canyon. Stewart moved onto Santa Paula, where he was far more successful as a founder of Union Oil Company. August Ferrier was a big-boned, dark-complexioned man with a drooping moustache who wooed and won the heart of a much younger woman. He was so jealously in love with her that he forbade her to leave their Newhall Avenue home or to have visitors. To guarantee these sanctions, ol' August poured snowy white sand around the house, checking for footprints when he returned. One fine day, he discovered her delicate tracks crossing the sandy moat and, in a fit of rage, placed a bullet in her kneecap. After that, Mrs. Ferrier seemed to have the upper hand, asserting her rights. Every so often, he would go off to France, the Mrs. refusing to accompany him, vacationing up at Lake Hughes with her relatives instead. It became something of a town joke to say, "I'd rather go to Lake Hughes" than to answer "no" to a question. At any rate, Ferrier acquired the house in 1911, moving it over to Walnut Street, leasing the place to Will Young, brother of Walton, who ran the Pico Canyon oil fields. The next occupants were Theodore H. and Belle Komelissen, he being a mail carrier, she a clerk. They separated for reasons best known to themselves, selling to the Kingsburrys in 1945. Charles Kingsburry was born in St. Louis, Mo., in 1880 [sic: 1879]. He moved to Trinidad, Colo., to become an agent for Wells Fargo, then volunteered for the Spanish-American War in 1898. After serving with distinction, he returned to Trinidad, working as a fireman, then went off to war again, suppressing insurgents in the Philippines, where he was commended for bravery under fire. Assigned to the Presidio at San Francisco, he managed to survive the great earthquake and fire to be honorably discharged a second time. Charlie was a jockey until he landed in Newhall on Aug. 9, 1919, as an employee of the [L.A.] Department of Water and Power, building the power plants up San Francisquito Canyon. When those jobs were completed, he found himself wrangling horses for the movies, owning a meat market, then guarding the secrets of Bermite during World War II. His wife, Ruth, was a graduate of the Trinidad Business College, finding employment with Hillburn's Funeral Chapel, where her dignity and grace helped many local families through trying times. Active in the Presbyterian Church, Masons, Eastern Star and Sheriff's Posse, the Kingsburrys were great animal lovers, she feeding stray cats at her back porch while he tended to his pride and joy, Sonny, a chestnut-colored stallion. They never had any children of their own, yet Charlie loved to take neighborhood kids for rides on his horse. He seemed to know just about everything, which rankled some residents. One day two men were chatting about horseshoeing when Kingsburry wandered by, corrected them, then walked off. "I suppose if we were talking about Alaska," one of the men remarked, "Charlie would have been an Eskimo." Kingsburry passed away in 1963. His wife, Ruth, died Oct. 22, 1982, at the ripe old age of 92. The Los Angeles Board of Supervisors saw fit to adjourn in her honor. Today the winds sigh through the old house, perhaps stirring memories of past holiday seasons. Once-gleaming white paint is cracked and peeling, while the only sounds are on weekends when hammers and saws are put into use by a doughty crew of volunteers. Jerry Reynolds is curator for the Santa Clarita Valley Historical Society and has lived in the SCV for 17 years. The Newhall Signal and Saugus Enterprise | Thursday, January 2, 1993. History books tend to single out people who have done something spectacular, such as winning a war, leading a country or discovering new land. We can't all be generals, kings or explorers, yet there are many who contribute to the general welfare of their fellow human beings, quietly going about their lives with no mention by historians, no songs written about them and little in the way of thank you's. Such a person was Charlie Kingsburry, admired by some, criticized by others. Charles H. Kingsburry led an interesting and adventurous life which began in St. Louis, Mo., on Aug. 19, 1879. The family later moved to Trinidad, Colo., where Charlie worked as a Wells Fargo agent. In 1898, he volunteered for that "Splendid Little War," as Theodore Roosevelt called it, and was packed off to Cuba where he fought in several campaigns, including the assault on Santiago. Honorably discharged, Kingsburry returned to Trinidad, becoming a fireman. With the outbreak of the Philippine insurrection he volunteered again, landing in Manila in 1901 and serving with Gen. Bowls [sic: see above]. Charlie did disappear for three days, no one knowing what he was up to, but survived jungle heat and ambushes plus a bout with malaria. Assigned to the peace and quiet of the Presidio at San Francisco, Kingsburry arrived just in time for the great earthquake and fire of 1906. Honorably discharged a second time, he was working as a jockey when he married Ruth Carnahan on Sept 12, 1912. Ms. Carnahan was one of those remarkable ladies of the period who was actually pursuing a business career. Born March 2, 1890, in Kansas City, Kan., she graduated from the Trinidad Business College and was working as a bookkeeper when she became Mrs. Kingsburry. It was extremely liberal of the groom in those far-off Victorian times to allow his bride to continue working. On Aug. 9, 1919, Charles went to work for the Los Angeles Department of Water and power, helping to construct Powerhouse No. l in San Francisquito Canyon. The excellent horseman also found work as a movie stuntman, wrangler and sometimes double for such Western stars as Tom Mix, Tim McCoy and Buck Jones. In 1927, he settled down to running the meat department of The Peoples Market on San Fernando Road in Newhall, building a home on Walnut Street [sic: Reynolds previously said Newhall Avenue. We don't know which is correct]. 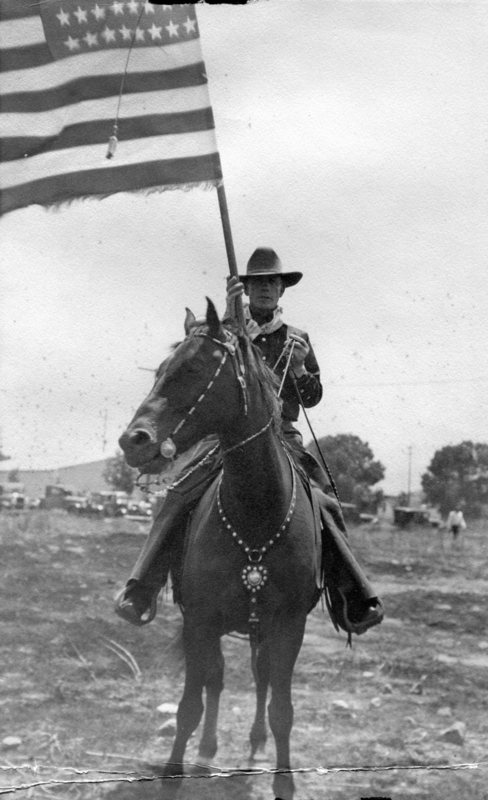 Joining the Sheriff's posse, he participated in search-and-rescue operations and usually led that group of horsemen in the Fourth of July parades, carrying a large flag. The Kingsburrys were animal lovers. Ruth fed as many as 13 stray cats at her back door. Charlie's love was horses, Comanche being a big dark Arabian, while Sonny Boy was almost a household pet. With the outbreak of World War II, he became a guard at Bermite and an air raid warden. For some reason they moved off to Oregon for a year in 1944, returning to Newhall and eventually buying another Walnut Avenue house. Ruth Kingsburry worked at Hillburn's Funeral Chapel where her tact and grace helped many grieving families through difficult times. She also did a lot of research on her residence, finding that it dated back to 1878 and was built for J.O. Newhall, a cousin of the town founder, Henry M. Newhall. The Kingsburrys were active ill many civic affairs, including the Presbyterian Church, school board, Masons and Eastern Star. In fact, Kingsburry had an addition put on his house so he could coach budding new Masons. He developed a routine of visiting widows and the infirm, running errands for them and often bringing them food. While they never had any children, Charlie and Ruth loved them. He often took neighborhood kids for rides on the broad back of Sonny Boy. In spite of a lack of formal education, Charles seemed to know just about everything about anything, developing a sort of know-it-all reputation. One fine day, Charles interrupted a curbside conversation about horses, then continued his walk. One man turned to the other remarking, "I suppose that if we had been taking about Alaska, Charlie would have been an Eskimo." Charlie Kingsburry passed away on Aug. 10, 1963, Ruth working at Hillburn's until the age of 87. She died Oct. 24, 1982, the L.A. Board of Supervisors adjourning in her honor. Five years later, the Kingsburry House was moved to Heritage Junction in Wm. S. Hart Park and will become a memorial to just an average couple who left their mark on the story of the valley. Jerry Reynolds is the associate curator of the SCV Historical Society and a resident historian.